As vegetables go, okra does not always get the attention it deserves. Besides being low in fat and calories, okra also contains essential nutrients such as potassium and calcium. Okra may be prepared various ways and is commonly found in Creole dishes such as gumbo. Adding okra to your diet can also positively affect your cholesterol levels. Cholesterol is a substance that is manufactured by the body, but also taken in through your diet. Some cholesterol is necessary for hormone production, but too much can increase your risk of heart disease and stroke by accumulating as plaque in the arteries. The Colorado State University Extension states that desirable total cholesterol levels are less than 200 milligrams per deciliter (mg/dL), while total levels of LDL cholesterol, the “bad” cholesterol, should be less than 100 mg/dL. Okra is a source of fiber, which is helpful to regulating the digestive system and lowering cholesterol. Fiber is a type of carbohydrate that the body does not digest. Soluble fiber is that which is dissolved in water. This type of fiber binds to cholesterol in the digestive tract so that it can be excreted from the body with other wastes, which lowers total cholesterol levels. 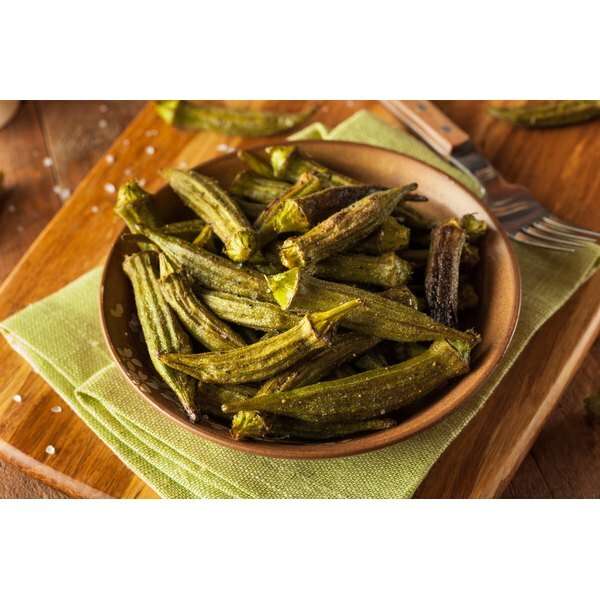 One half cup of sliced, cooked okra contains 2 g of dietary fiber. Adding okra to your diet can also help to lower cholesterol and triglycerides, because it contains no cholesterol and very little fat. When you eat more of foods that do not contribute to overall cholesterol levels, such as okra, you may eat less of those foods that are high in fat and cholesterol. Replacing high-fat foods that also contain high levels of cholesterol, such as fatty meats or rich desserts, with vegetables such as okra can lower your total cholesterol levels, unless prepared in products that contain cholesterol, such as butter or lard. Like most vegetables, okra contains phytosterols, which may help to lower your cholesterol. The Cleveland Clinic advises that phytosterols are compounds found in the membranes of plant cells that are similar in structure to cholesterol. They compete with cholesterol molecules for absorption during the digestive process, reducing the amount of cholesterol absorbed and thus helping to lower levels in the bloodstream. Okra contains 24 mg of phytosterols in a serving of eight 3-inch pods. Okra is a source of vitamin C, an important antioxidant that protects the body from some diseases. One half cup of cooked okra contains over 13 mg of vitamin C, which may help to lower cholesterol. According to the University of Georgia, vitamin C helps to convert cholesterol into bile acids, which are important for fat digestion, a process which lowers your total cholesterol levels. Vitamin C also helps to slow the oxidation of cholesterol, which can cause damage to vessels and contribute to plaque buildup and atherosclerosis.